If you have kids, then you’re already deep in “back to school” mode. I was in Target this weekend and it looked as if it had been hosed down the bright yellow pencils, black and white composition notebooks, and Elmer’s glue. I started feeling a bit nostalgic for the smell of pink erasers! Anyway, if you’re in this boat then you might be looking for ways to reduce the environmental (and social) impact of your back to school shopping. And, choosing an eco friendly or fair trade backpack for you or your kids is a great way to do this! Our bags happen to be both. Yay! Here are a few of my favorite fair trade backpacks we’re offering this year. As always, these bags are fair trade made by our artisans in Nepal. And, all the proceeds of Earth Divas go directly back to the artists at the end of the year. So, each purchase makes a huge difference in the lives of each artisan we work with! I love our Hemp Color Patch backpack! This bag is incredibly well made and fun to tote around. And, being hemp, it will stand up to the abuse your kids will put it through. 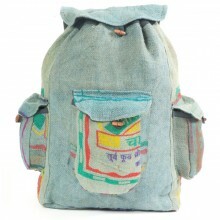 Our awesome Recycled Jute Backpack is made from, you guessed it, recycled jute rice bags! I use one of these backpacks myself and I love it. Whenever I take it out I always get a lot of questions and comments about the bag, because it’s so unique! This bag actually holds quite a lot of stuff, so it’d be great if you or your kids are in high school or college. 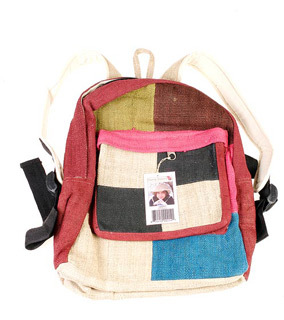 We have plenty more fair trade backpacks on our site, so head over to check them out!